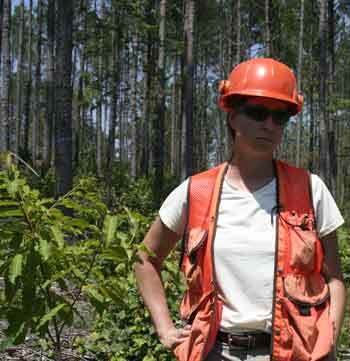 Stacy Clark in the field with American chestnut seedling. Photo by Rod Kindlund. The American chestnut tree (Castanea dentata) dominated the forest canopy in the eastern United States for thousands of years, until it was decimated by an exotic fungal pathogen, the chestnut blight (Chryphonectria parasitica) in the early part of the 20th century. Since then, tree enthusiasts and scientists have been trying to find a way to produce an American chestnut tree with resistance to the blight. 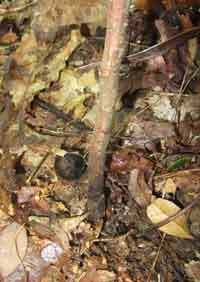 The American Chestnut Foundation (TACF), formed in 1983, has reached a point where they can test what is hypothesized to be a tree with blight-resistance that otherwise behaves like an American chestnut. Efforts to test the reintroduction of blight-resistant chestnut seedlings have been underway since 2007, when TACF, the U.S. Forest Service, and The University of Tennessee (UT) began collaborating on chestnut restoration research on national forests lands. TACF provided material to the Forest Service for the establishment of eleven field plantings that included 4,596 trees, 2,022 of which were the first potentially blight-resistant seedlings raised through TACF back cross breeding efforts. Stacy Clark, research forester with the Southern Research Station Upland Hardwood Ecology and Management unit, leads these efforts for the Forest Service and recently shared findings from the first 3 years. American chestnut seedling showing symptome of Phytophthora cinnamomi,or ink disease. Photo by U.S. Forest Service. Other exotic pests affecting seedlings included the Asiatic oak weevil (Cyrtepistomus castaneus), the Asian gall wasp (Dryocosmus kuriphilus), and Asian ambrosia beetles (Coleoptera: Scolytidae). These exotic pests will have negative impacts on chestnut restoration, and there are currently no adequate control methods for them. Native pests may also take their toll on restoration plantings. Researchers observed severe cicada damage on one planting, and the rarely observed chestnut sawfly (Craesus castaneae) was noticed defoliating experimental seedlings and natural sprouts. Read the October 20th article in the Knoxville News-Sentinel by Morgan Simmons. Read more about the field plantings in a recent article by Clark and collaborators. Read Clarks just published article on nursery performance of American chestnuts and backcross generations in commercial tree nurseries.